This article is about what sleepwalking is which is also known as somnambulism. 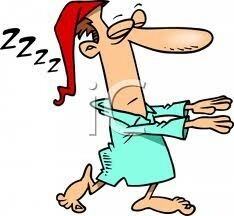 We have all heard of sleepwalking and some of us have done it at one time or another in our lives. To understand sleepwalking, it is necessary to know more about the two main types of sleep i.e. R.E.M. sleep and non R.E.M.sleep. Sleepwalking occurs during non R.E.M. sleep usually within a couple of hours of going to bed. Most of us are completely deactivated during non R.E.M. sleep but sleepwalkers are not as they take some part in their dreams during the sleepwalking episode. Sleepwalking, also known as somnambulism, occurs when someone arises from a period of non R.E.M. sleep and performs rituals or activities that are usually only performed when awake or in a state of full consciousness. In most cases, somnambulists perform simple, ritualistic activities but sometimes the activities performed are more complex in nature. It is unusual for the sleepwalker to have any memory of the sleepwalking incident due to the lack of full consciousness at the time. During an episode of sleepwalking, a somnambulist's eyes are open but their faces are dull and expressionless. Somnambulism usually occurs during the first few hours of a night's sleep and can last for seconds or up to half an hour. It is usual for there to be only one episode of sleepwalking during a night's sleep. It is common in children but less so in adults when it is often accompanied by or a sign of mental health problems. Sleepwalking is not a very accurate term for the condition as many somnambulists often stay in bed for the duration of the sleepwalking phase of sleep. Sometimes they merely sit up in bed with their eyes open and talk without making any sense. Alternatively,they can make repetitive movements.In some instances, sleepwalkers undertake activities that require full consciousness. They often go to the bathroom, clean their room or even cook or drive a car which can be dangerous to themselves and others if they are doing so in a sleepwalking state. Somnambulism has been used effectively as a defense for violent behavior in a court of law. It has been known for people to be acquitted of their responsibility for violent acts even in recent times. All that is required is for the court to be satisfied that the crime was committed unconsciously while asleep and the perpetrator is not considered to have been acting responsibly. However,the sleepwalking plea for leniency does not always work in a court of law. In summary, sleepwalking is common in adults with associated mental health problems, after taking alcohol or as a symptom of some medical conditions. It is a myth that someone cannot injure themselves while sleepwalking as if a person tries to undertake activities while sleepwalking that require full consciousness,they can injure themselves or others. Sleepwalking in children usually decreases in frequency as the child gets older. The best preventative measure for sleepwalking is to avoid becoming too tired, to avoid insomnia and the consumption of alcohol before bedtime. Interesting post! Luckily no one at my house sleepwalks, but its good to know! My son sleep walks and it creeps him out when I tell him about it the next day! In fact he sometimes remembers bits of it.